Alabama President Robert Witt topped the list of notable University dignitaries in attendance. NEW YORK -- The Greater New York Chapter of the University of Alabama Alumni Association (UANYC) enjoyed another great night of fellowship and friendship at the Silverleaf Tavern in midtown Manhattan as nearly 75 Alabama alumni gathered for its 2011 Holiday Party. Alabama President Dr. Robert E. Witt highlighted the group of University and athletics department dignitaries in attendance at this year's event. President Witt addressed the crowd, giving a brief update on University initiatives and extending praise to UANYC for its continued and committed support of the Capstone. In true UANYC fashion, chapter president Christopher Hollinger followed President Witt's comments with a second donation on behalf of the chapter to the University's Acts of Kindness Fund. 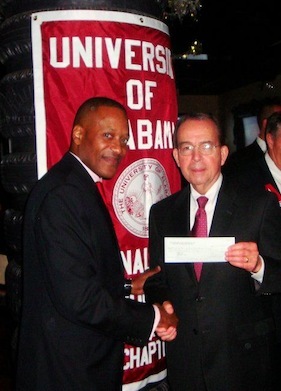 The chapter made an initial donation to the fund earlier this year after its UANYC for Tuscaloosa Fundraiser in April. Reese Goode (’06) received the 2011 President's Awards for outstanding dedication and service to the chapter. Goode was presented the award for his efforts throughout the year, espeically as chair of the chapter's Career Development Committee and for his tireless work to help organize the silent auction for UANYC's tornado relief fundraiser for his hometown of Tuscaloosa. Goode also helped coordinate the silent auction and raffle for the 2011 holiday party with items donated by Corey Gibbs of Ticket Solutions, Inc., and Holly Peterman of HBO. "It's such a special night when we can spend time with our Alabama friends visiting from the University," said Hollinger. "The holiday season is a time to be thankful and we, as a chapter, have so much to be thankful for coming off one of our most successful years in recent history."